Over the past year Resicast has started to introduce what I believe is an interesting range of early-war figures and kits. This recent release follows that early-war theme with the production of a standing/walking British Soldier in full 1940s gear. The figure was sculpted by Gerard Detroeye and the box art painting is by Christopher Nachtergale. The figure comes packed in the standard Resicast fashion for small kits, namely two zip bags with a coloured paper insert showing the manufacturer and product details. The figure is cast in a light cream-coloured resin and depicts a standing/walking BEF infantryman in Great Coat and full webbing. The figure consists of 4 simple parts plus equipment. The sculpting and casting are excellent and I could see no cause for concern there. The package contains 9 parts, the body cast as a whole, separate arms, a choice of two heads, back pack, water bottle, SMLE rifle and digging tool complete with bayonet. The figure comes dressed in great coat order with DB trousers, anklets and boots, with the collar of the great coat turned up. Detail on the coat, anklets, and boots is excellent. Around the waist is a set of 37 pattern webbing, consisting of left and right ammo 37 pattern belt. The brasses on the front and rear of the belt and pouches are all present and correct. On the chest the figure wears a Mk VI respirator haversack, and the ammo pouches are worn slightly wider and lower as was the norm during this time period. 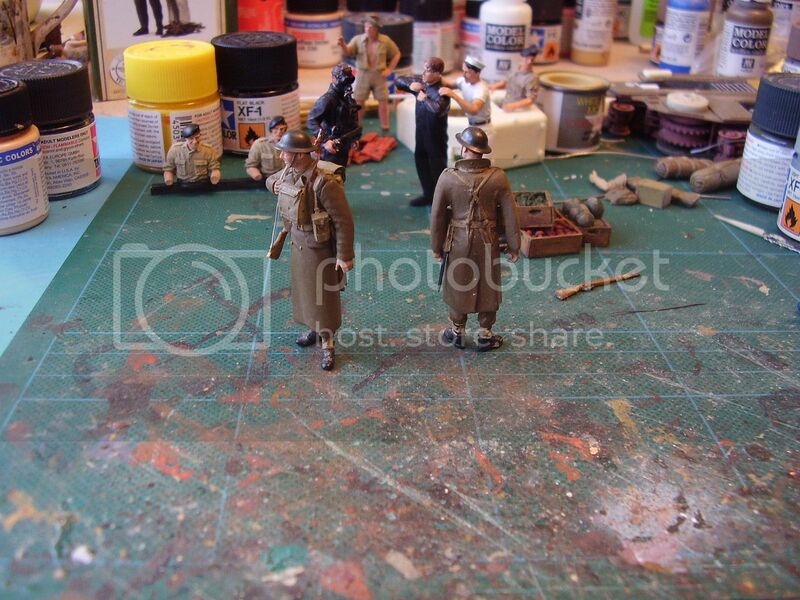 To add to the figure you get a choice of two heads, one with a field service cap and the other with a Mk II helmet. Both heads are well sculpted with good expressive facial details. You will need to add the left and right arms of the great coat and again both the arms and hands are excellently done. Additional equipment comes in the form of a skeleton type water bottle, a back pack with folded groundsheet, a SMLE rifle and finally a combined 39 digging tool and No 1 Bayonet. The figure stands approximately 44mm from heel to shoulder and the body proportions are in keeping with the standard range of Resicast figures. This is another cracking figure from Gerard and Graham. Although marketed as a 1940s BEF figure this one could be used just about anywhere in the early-war period where full marching order was needed. The choice of two heads is a very useful option, and the addition of the early-war equipment and SMLE complete this chap nicely. The SMLE is really well done and this is the first time I’ve seen anyone produce the combined digging tool/carrier and No 1 bayonet. Whether you are a figure painter or a diorama builder this figure could fit into many situations which are only limited by your imagination. The detail (as always) is stunning and the casting excellent. In many ways this is an iconic figure as this particular format of dress and equipment was prevalent during the early-war period. Resicast have now almost all the options they need to produce an early-war set of accessories, something personally I’d like to see available on the market. On the figure front there is a combination of skill, knowledge and expertise within those who work along with Graham that never ceases to amaze me, as the end result is often more akin to a work of art than a simple 1/35 scale figure. Simply beautiful work.